Hunters will appreciate the strong terminal performance of this .223 Remington ammunition from Winchester. These cartridges work well in AR-15s and other 5.56 NATO and .223 Remington firearms for taking down everything from rabbits to coyotes and smaller deer. 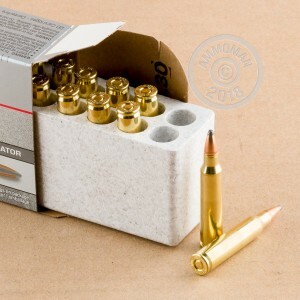 Each cartridge in this case of 200 propels a 55-grain soft point bullet to a muzzle velocity of 3,240 feet per second. The soft point projectile expands rapidly thanks to the high velocity of the .223 platform; however, it does not fragment as a hollow point would and cause excessive meat damage. This ammunition is made in the USA using noncorrosive Boxer primers and reloadable brass. 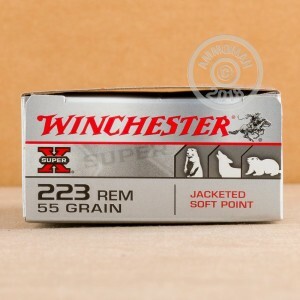 Winchester is one of the top manufacturers of quality ammo in the US; their Super-X line encompasses a wide variety of products geared toward outdoor sporting activities, though many are also used for defense and target shooting as well. Place an order for this case or any other items totaling $99 or more to get free shipping at AmmoMan.com!